Sixth grade art students at Hillview Middle School received a special lesson from Jay Gluckman of the Magical Bridge Foundation as part of a playground design unit with their teacher Anna Kogan. Jay talked to the students about the differing abilities of children for whom Magical Bridge playgrounds are designed, what surface types are used, how to create wheelchair access, and other ways playground equipment can be built for the most accessible play. 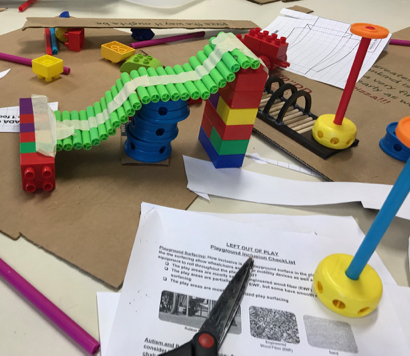 Students then imagined their own inclusive playgrounds and prototyped them with materials like cardboard, legos, tinker toys, and wood. The lesson was a creative way to combine 3D art, engineering and math, collaboration, and empathy. Throughout the year, all Hillview sixth graders will have the opportunity to participate in the inclusive playground design unit in their art class.